Where Does Our Trash and Garbage Go? The United States generates close to 251 million tons of trash every year. Sound like a lot? It is. In fact, the US is the top producer of municipal solid waste (MSW) in the entire world. So, once you throw your trash in the dumpster, what is its next destination? This is the story of the journey of your trash! How Much are We Trashing? The landfill is by far the most popular destination for MSW, though some cities like San Francisco and Seattle are able to recycle more MSW than they send to the landfill. Chances are, however, that your trash is probably ending up at the dump. Some of the bigger states, like Texas, Florida and Nevada, are dumping over 10 million tons of waste each year. While wasting is rampant among the United States, we are also recycling millions of tons a year. The biggest recycling states include California, the Carolinas and Minnesota. Some states are provided incentives to recycle, such as 5 or 10 cents back on recycled aluminum cans, glass bottles and plastic jugs. States around the country also have mandates in place that require recycling of certain materials, like aluminum cans or plastics. These different facilities can be found all over the country, but many factors contribute to where they are located, such as local regulations and state mandates. But Where Does it Really Go? Where Does the Journey End for Our Trash? 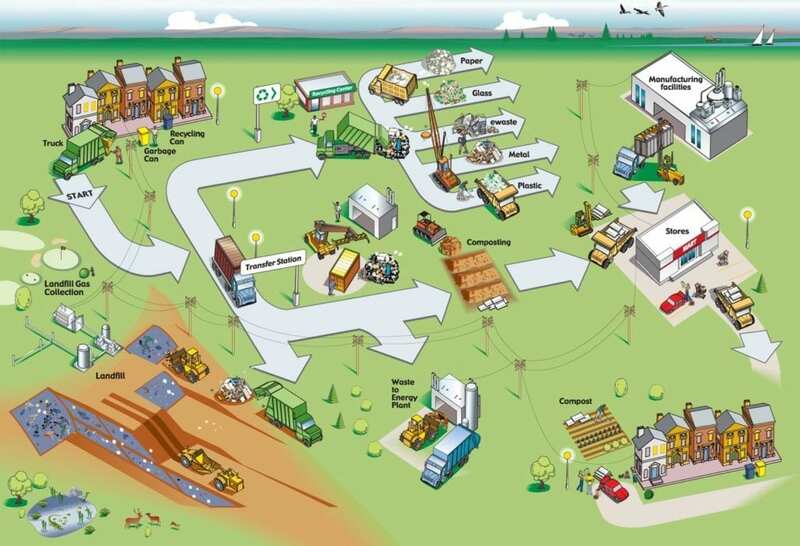 After its time at the transfer station or MRFs, your trash then travels to be stored, recycled or used to make energy. The majority of our garbage ends up in a landfill. When you think “landfill,” you may think of an open dump made up of a mountain of garbage. Thanks to the Resource Conservation and Recovery Act (RCRA), however, open dumps are no longer allowed. Since 1976, the EPA has the authority to control hazardous waste from the “cradle to the grave,” which includes the generation, transportation, treatment, storage and disposal of hazardous waste. In 1986, the RCRA was amended to address environmental problems resulting from hazardous waste. About one-third of our solid waste goes to either a recycling or composting facility. What’s the difference? An incinerator is a large industrial furnace that is specifically designed to burn MSW. Incinerators are kept at 1,800 degrees Fahrenheit to ensure all trash is converted to ash. Incinerated trash has 95% less volume, which drastically reduces the amount of landfill space needed. Additionally, the heat from incinerators can provide both heat and electricity to the local surrounding area. Anaerobic digesters can put organic materials to use through creating energy and fertilizer. These machines can be found on a farm where organic waste is readily available. Some farms will also accept food waste from restaurants, grocery stores and communities.